In considering my contribution to this WebLog, I have chosen to focus on the theme of “Story”. Faye Ginseng (2002) makes this statement connecting the use of digital technology, story and indigenous people: “[I]ndigenous people are using screen media not to mask but to recuperate their own collective stories and history … that have been erased in the national narratives of the dominant culture and are in danger of being forgotten within local worlds as well” (p.40). The following additions to this WebLog focus on the evolving of sharing past indigenous story through the use of present-day technology. Ginsburg, Faye D., “Screen Media: Resignifying the Traditional in Indigenous Media,” in Media Worlds: Anthropology on a New Terrain, eds. Faye D. Ginsburg, Lila Abu-Lughod, and Brian Larkin, Berkeley: University of California Press, 2002, 39-57. Strong Nations is an online book store that focuses on bringing indigenous literary text to all people. Their mission statement includes these words: “It is our hope that we can bring indigenous text to all peoples in order to create pathways that support the building of strong nations together”. The material available at this site ranges from children to adult literature and includes both fiction and nonfiction stories. Oral storytelling is a key part of First Nations culture and is primarily how traditional knowledge is shared to new generations. This resource is valuable in sharing key aspects of oral storytelling, traditional stories told through video, and teaching helps for educators desiring to bring oral storytelling traditions into the classroom. An online inquiry project resource described as a “hands-on, collaborative, inter-generational, artistic journey of seeking truth about the history of Aboriginal people in Canada”. This site includes an extensive collection of resources for users to move through their inquiry learning journey. Educators, church groups and professionals have participated in Project of Heart throughout Canada. 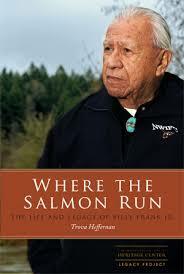 An online story based on interviews with the Nisqually elder, Billy Frank Jr., and others who are close to him. Billy Frank Jr. played a key role during the 1960s and 1970s as an activist campaigning for treaty rights and environmental consciousness related to salmon fishing rights on the Nisqually River in Washington. A series of comical graphic novels written as a collaborate work by Christopher Meyer, Tanya Leary and Chad Solomon. The stories and characters are based on traditional Native teachings incorporating The Seven Fires Prophecies and The Seven Grandfathers. The characters are from the Anishinabek Nation and the storylines lead them through challenges that are are handled peacefully while addressing traditional teachings.